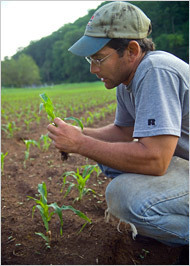 EARTH MAN Paul Bucciaglia of New Milford’s Fort Hill Farm. WAIT-LISTED for broccoli rabe? I blinked at my computer screen in disbelief. In fact, it was worse than that. A polite, regretful notice on the Web site for Fort Hill Farm, an organic producer here, informed me that the wait list for a seasonal share in the farm’s C.S.A., or community-supported agriculture program, is now closed until at least 2009. And it’s not sure when the list can be reopened. Having munched and swooned our way through Fort Hill’s chard, heirloom tomatoes, fingerling potatoes and other dewy fresh produce for a few years at local farmer’s markets, we thought we would look into a C.S.A share: Pay the farmer up front in February and pick up a box of vegetables, herbs and fruit weekly from June to October at the farm or at designated drop spots. C.S.A. shares are generally calculated to provide a week’s worth of fresh, organic, locally grown produce for a family of four. Some farms, like Fort Hill, also offer pick-your-own options that send shareholders into the strawberry and tomato rows. Nonetheless, he is voluble on the subject of disappearing or unaffordable farmland in Connecticut — a problem that limits how much his business can grow. Most of the state’s veggie consumers still don’t know a C.S.A. from a G.P.S. Yet the demand for buying quality, locally grown food directly from farmers is so great that the area’s organic growers cannot meet the demand; Holcomb Farms in West Granby, the only farm comparable in size to Fort Hill, sold out its 350 shares for this season before last Thanksgiving. Fort Hill operates on a lovely tract of rich, well-drained soil leased from the Sunny Valley Land Trust, which is mandated to keep some of its land in cultivation. Driving up from the south, the stretch of Route 7 long bordered by cornfields, farm stands and silos is now an unlovely sprawl of condo developments, corrugated-metal big-box stores, a megachurch surrounded by acres of steaming macadam, and several plots of gouged and bulldozed landscape with signs advertising “Topsoil for Sale.” The most fundamental element of the state’s rich agricultural past is being trucked off for gated estates and golf courses. He thinks that FarmLink, the state’s year-and-a-half-old Web site designed to connect farm owners with others seeking land, is a good resource, but that preservation efforts are lagging. Mr. Bucciaglia cited a nearby property I had asked about that has been scraped of its topsoil and sits, ugly and forlorn, with a “For Sale” sign. When winter winds howl and his venerable fleet of used tractors stands idle, Mr. Bucciaglia does his thinking. And ciphering. Fort Hill also donates produce weekly to the New Milford food bank. “I do think it’s important that people of all income levels have access to high-quality food,” Mr. Bucciaglia said. As a pair of chickens began a noisy disagreement, Mr. Bucciaglia said that he had recently found one of their number dead just inside a greenhouse. As he bent over the carcass to determine the means of dispatch, a huge red-tailed hawk sauntered past the farmer, ignoring him, and tucked into his fresh-killed meal. Raptors, like land developers, get their nourishment by pouncing on the main chance. But for the rest of us arugula eaters, it’s looking like a mighty long wait for a local share.